The 23rd of August passed by rather unremarked this year. 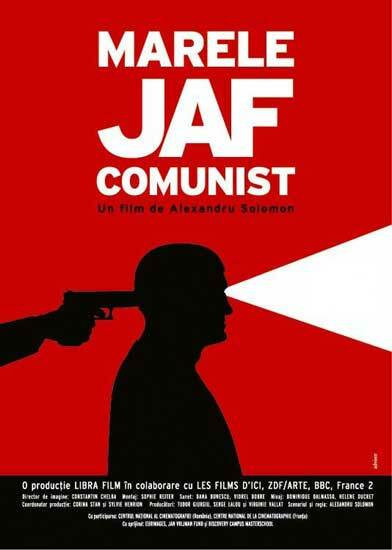 But for those who do associate something with the former national day celebrating the 1944 'liberation' from fascist Germany, the Cărtureşti library decided to mark the date by screening Alexandru Solomon's 2004 documentary Great Communist Bank Robbery/Marele jaf comunist, freshly presented in a slick DVD collector's edition. As the director jokingly stated, the day should be “celebrated” by using the film's robbery theme to reflect on how we are being lied to today. The movie features the 1959 robbery on the Romanian National Bank and the state's decision to shoot a film about it casting the robbers, who were all Jewish, as it happened, and who had got caught shortly after the act. The reconstruction (aptly titled “Reconstruction”) was meant to be a cautionary tale about stealing from a state and its hard-working citizens, but is actually a propaganda picture with a brutal ending, both on and off screen. Using the found print of the film in archives, Solomon's documentary spins a tale of secrets, manipulation, and paranoia and does it with a playful, ironic, and highly intelligent study on the construction of “truth”. It is surprising how little anyone knows about those particular years of the communist period and Solomon makes a brilliant job of digging up a spectacular story. To give the filmmaker even more credit, he also tackles a sadly still problematic historical aspect in Romania, namely the state's persecution of the Jewish community. The detail of the robbers' religious identity is revealed subtly, catches the audience completely off-guard and eventually builds up to a saddening climax. The unhurried tempo, minimalist use of cinematic devices and gentle humor defuse the brutality of the topic a bit and the documentary thus makes for highly entertaining and informative viewing; the idea to screen the film again after eight years is laudable. As Solomon enjoyed digging up further hidden facts about Romania's communist and recent past in the subsequent Cold Waves (2007) and Kapitalism: Our Improved Formula (2010), there's surely much to look forward to in his next detective work. The collector's edition of Great Communist Bank Robbery featuring English subtitles can be purchased at the Cărtureşti libraries in Romania for RON 40. The English subtitled version can also be found online. More information on the links can be found on the director's official website.